The horror, the horror . . . 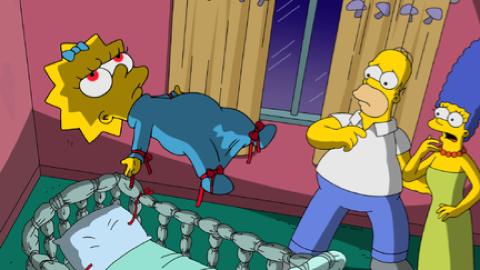 The Simpsons’ 28th Treehouse of Horror. Boo, it’s coming again on Sunday, Oct. 22nd at 7 p.m. (central) on Fox, where Homer, Marge, Bart, Lisa and Maggie have been taking up residence since a Dec. 17, 1989 Christmas special. It’s so long ago that ABC’s original MacGyver and Dynasty series were still on the air and since have reemerged as reboots on CBS and The CW. Fox sends the latest Treehouse every October, always with an accompanying vessel full of Halloween candy. Your friendly content provider of course can’t be bribed, but, er, most of the candy will be re-gifted to trick or treaters (well, at least half of it) and it’s been quite a while since I’ve paid any attention to this annual rite of lightly coated scariness. As usual, the latest Treehouse has a new opening sequence and then three tales, each disembodied from the other. “Coralisa” finds Lisa venturing to meet her “other family” through a portal at the direction of the Simpsons’ cat, Snowball. The show’s 3d animation technique is deployed to good effect here. It proves to be only a wee bit stomach-wrenching, though, when Homer begins consuming himself as a “Me-gan” after being left home alone and to his own devices. Among the offshoots are a chain of “Kentucky Fried Simpson” restaurants. Apparently there’s an awful lot of Homer to go around. It’s signed by Kang & Kodos, the aliens from planet Rigel VII. Look to see them again -- but don’t blink -- in the opening Halloween candy segment, which also is in 3D and ends rather badly for the Easter bunny. OK, you’re now on your own. And it’s always fun to go out on these limbs.